I spend a lot of time thinking about how to encourage people (trick people into?) eating more vegetables. 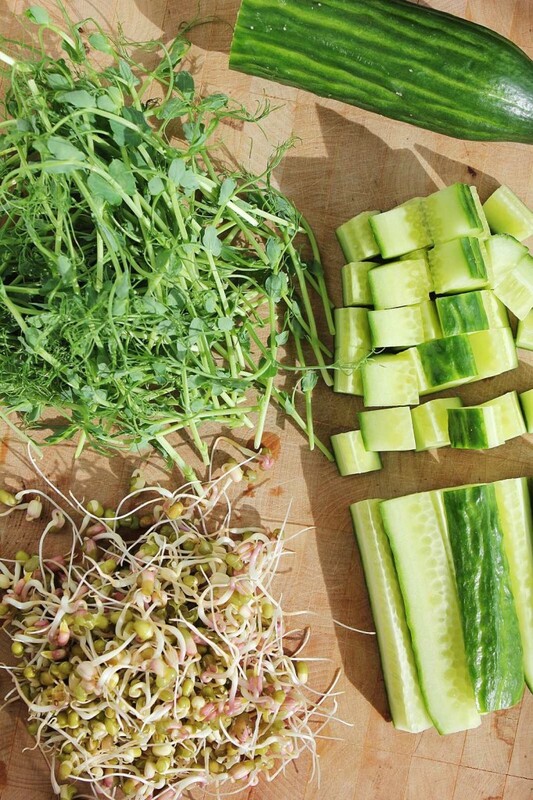 It is just too easy to become bored with ‘salad’ or to eat the same convenient veggies all of the time until we can’t bring ourselves to eat them anymore. If we keep them fresh and interesting, eating more vegetables and an a greater variety of them will not feel like a chore. 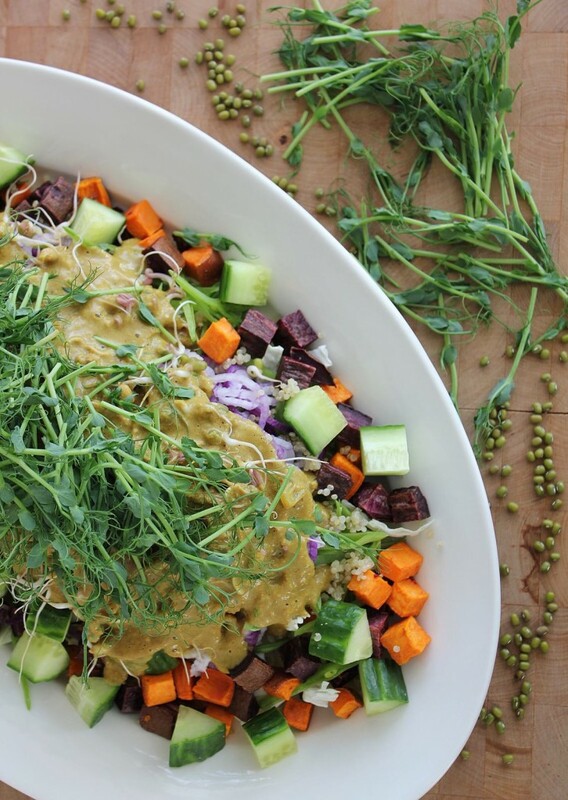 Gado-gado literally translates to mix-mix but it may as well translate to ‘this peanut sauce is going to trick you into eating aaaaaalll these veggies’, because that is what happens every time. In my experience, pour on a warm, delicious sauce, bonus if it is Indonesian, and whatever it is mix-mixed with will get eaten. So naturally it would make perfect sense to pour a (peanut-free) version of this delicious sauce onto a rainbow of veg that we might otherwise have found tedious to get through. This sauce will transform those very same veggies that we dip into hummus and blend up in our green smoothies every day into something more interesting, and actually quite exciting. The best part is it’s really very easy. Once you have the sauce made (5-10 minutes) you could pour it over any combination of veggies that you happen to have on hand. Like most of my recipes, I warn you that this is not a classic gado-gado salad recipe, it has been given the crushing cancer stare-down and has come out the other side a little bit cleaner and more colourful. It still tastes amazing though and will make your insides sing. Opera, probably, the happy kind. 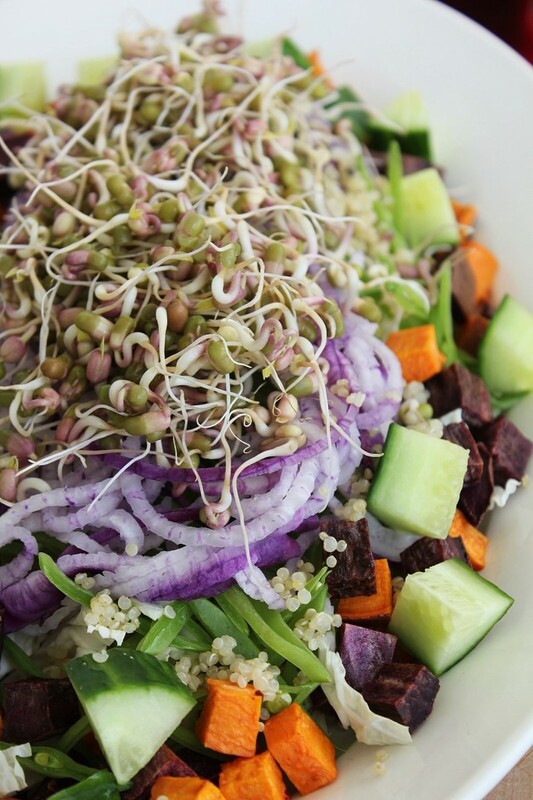 In this recipe, I have added quinoa for protein and bulk, mung bean sprouts (grow your own!) for the freshest of enzymes and some more protein. 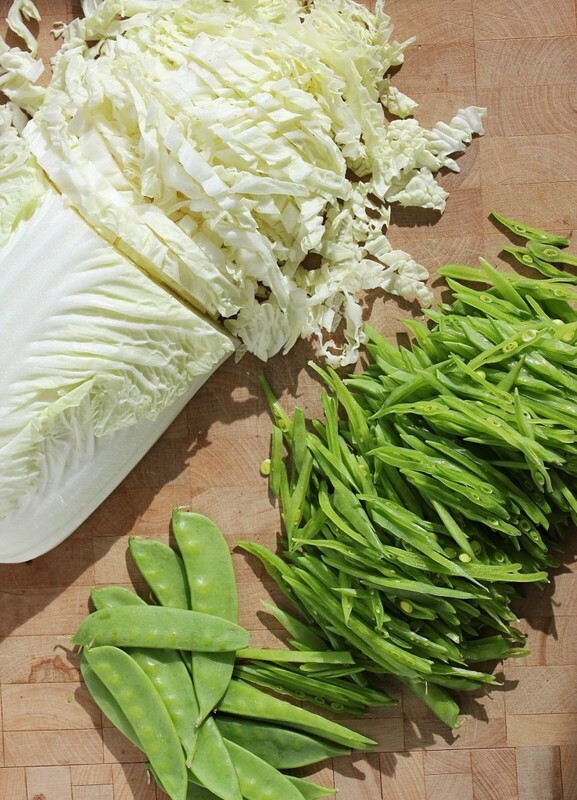 I have shredded Napa cabbage because I think the fluffy, crisp texture tastes great when raw, but also works when parts of it get warm and wilted from the rich, smooth sauce. 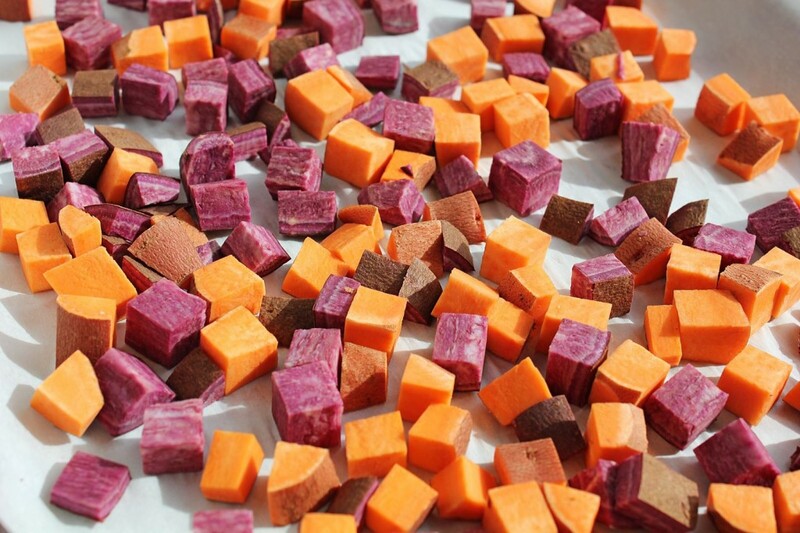 Diced and roasted sweet potatoes give some textural contrast and could easily be replaced with any leftover roasted veg from the night before (even a leftover baked sweet potato could be used, just dice it up). 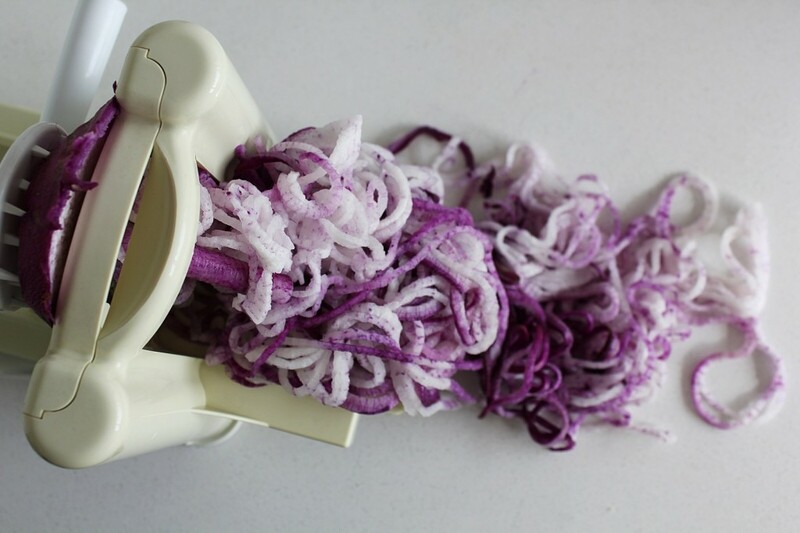 I spiralized a purple daikon because I’m a show-off, but you could dice that up instead (and it doesn’t have to be purple either, white ones are easier to find). The temperature is pretty important with this salad. The veg can range from cold to warm but the sunflower seed sauce should really be warm-hot. For a crowd, I like to serve it on a platter and pour the sauce over top so that people can serve themselves. The only down-side to doing it this way is that any leftovers will be cold, congealed strangeness that likely won’t get eaten. The solution to this (if you think there will be leftovers) is to serve the warm sauce onto plated salads (not the entire amount) so that leftover salad will be sauce-free, and you will be able to heat the sauce separately the next day. Alternatively, you could gently warm the whole thing up the next day in a low oven. The sunflower seed sauce, although wordy, tastes just like peanut sauce and would be amazing spooned over some steamed broccoli or gai lan, or served as a (collard green-wrapped) salad roll dip. It also freezes well so make extra! On a large platter (or on individual plates) layer all of the fresh ingredients -cabbage, sprouts, quinoa, daikon, sweet potatoes, cucumbers, cilantro and green onions. Squeeze the lime juice over top. In a small saucepan, sweat the onion in coconut oil and a small splash of water. Once soft, add the garlic, ginger and turmeric and sauté for a couple of minutes. Add the date, water, coconut milk, tamari and sunflower seed butter. 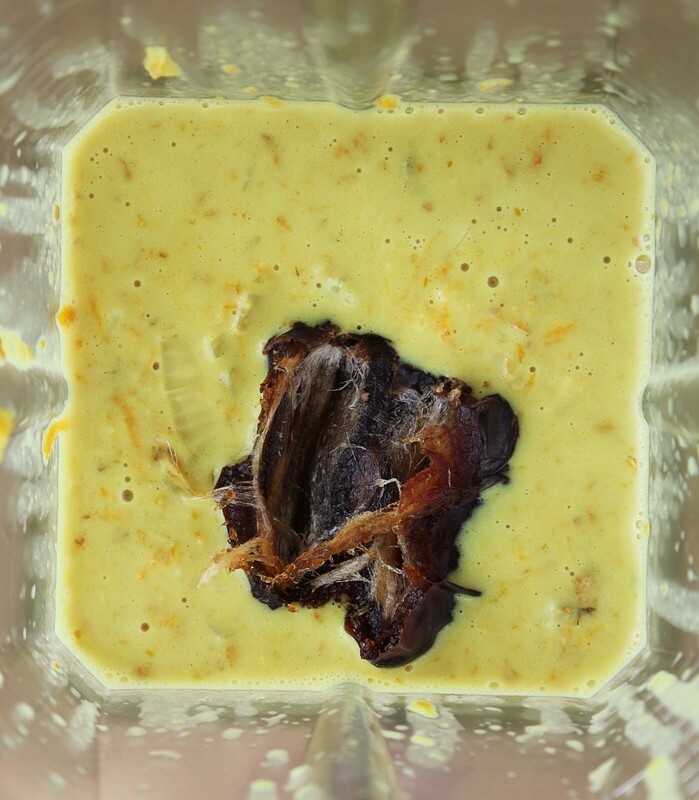 Simmer for a few minutes and then blend up in a blender. Adjust seasoning. Pour over top of the salad. Top with pea shoots and serve.